If you have a rooted Android device and wish to keep your root and wish to keep your root when receiving an update there is now an application available that can do just that for you. 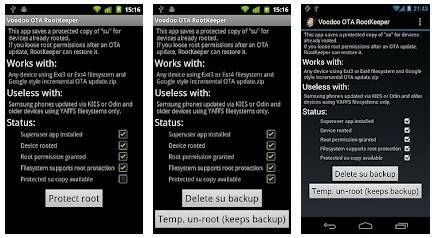 The app is called OTA Rootkeeper and is the first version of Voodoo OTA Root Keeper distributed under the WTFOL open source license. OTA RootKeeper for Android will make a backup or protected backup of your Android device’s root although it will not root your device and thus your handset or tablet must already be rooted, and if certain conditions are matched will make root survive OTAs with the exception of system partition formatting. Apparently systems where OTA Rootkeeper is effective include the Nexus S, Samsung Galaxy Nexus and all Android 3.2 Honeycomb tablets, whilst OTA Rootkeeper has been found not to protect such devices as the Samsung Galaxy S, HTC Desire, Samsung Galaxy S2 and Galaxy Spica. Requirements are: /system partition as Ext2, Ext3, or EXT4. In most cases the OTA RootKeeper app shouldn’t interfere with an OTA update process itself, and a bonus feature allows the user to un-root a device whilst keeping a su backup and thus you can natively hide root until you opt to restore it. Judging by the comments on the Market it appears that OTA RootKeeper does what it says it does and is a very easy application to use and has already gained 191 5-star user ratings. So if you’d like to give the OTA RootKeeper app for Android a whirl you can download the app to your chosen Android device for free by hitting up the Android Market. But OTA Root Keeper doesn’t have the ability to root devices. just triedÂ OTA rootkeeper on my htc desire hd so I could use sky go but didn’t work does anyone know how to view sky go using a rooted htc phone, I would unroot it but I am not that techy and would probably lock my phone.